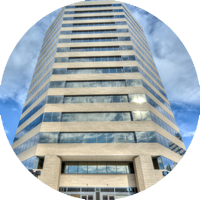 Executive Business Centers is the premier provider of commercial offices in the Denver Tech Center area. Our class A buildings and well-appointed floors provide a professional image for your business, and our views of the Rocky Mountains and downtown Denver are sure to impress your clients. Our all-inclusive program helps us cost-effectively manage your office space in Denver so you can focus on managing your business. We have hired and trained our team to support your growing business, and we make it quick and simple to establish a professional image for your company. Flexible short-term leases can expand and contract as your business needs change, helping you avoid the long-term commitments and financial obligations of traditional leasing. With a variety of floor plans and sizes, we have the perfect office space in Denver to fit your small business needs. Click below to see our floor plans and contact us to set up a tour today! Access to 10 conference rooms in our DTC locations and 650 worldwide business centers! Not ready for a full-time office space but still need a professional image? Click below to see our Virtual Office Programs or to see our conference rooms available to rent for your next meeting!